The analysis and case study below are excerpted from a Case Summary series offered by the National Disability Institute's ABLE National Resource Center(ABLE NRC). John Nadworny met Chris Rodriguez of the National Disability Institute at a meeting prior to the ABLE's passage and has worked with Chris and the ABLE NRC on a number of presentations and webinars educating the public about ABLE. We share below information from the case studies presented by ABLE NRC. The case serves to illustrate the impact of the ABLE Account on Social Security and Social Security Income (SSI) disability benefits. 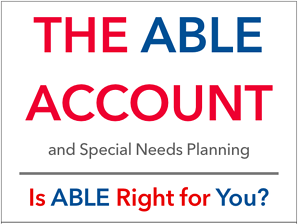 The ABLE Account offers an individual with a disability, which began before age 26, an opportunity to save funds in a dedicated account to meet " qualified disability expenses" that will allow them to improve health, independence and quality of life. To view the benefits, limitations and rules related to the ABLE Account, see ABLE Accounts:10 Things You Need to Know. SSI is based on financial need and therefore impacted by any income received by the SSI beneficiary. Note: SSDI is not a means-tested benefit and is not impacted by the ABLE account. In 2018, the maximum SSI federal benefit is $750/month with states supplementing this amount at their option. Unless income exclusions apply, any income received by the SSI recipient will effect the SSI monthly payment amount. The maximum countable resources a beneficiary is allowed is $2000. If resources go above $2000, the right to an SSI payment may be suspended. If resources remain above $2000 for 12 months, the SSI is terminated. • Contributions of the designated beneficiary to the ABLE account, from his or her monthly income (i.e., income other than SSI), will still count as income for SSI (subject to any income exclusions) and may result in a reduction to the SSI payment. Contributions from all others are excluded and not counted as income of the beneficiary. • Earnings from the ABLE account are excluded and not counted as income or against SSI resource limits. • Up to $100,000 of the account balance is excluded by SSI and not counted toward the $2,000 SSI resource limit. • When the value of an ABLE account exceeds $100,000 and the amount above $100,000, combined with other resources, results in countable resources above $2,000, SSI payments are indefinitely suspended. • Unlike the general SSI rules related to excess resources, SSI eligibility is not terminated after 12 months of excess resources related to the ABLE account. SSI payments will be restored once the overall countable resources are reduced to $2,000 or less. Under SSI’s ABLE policy, two years or several years could elapse and the beneficiary can return to SSI payment status when countable resources are again below $2,000. Mario has $101,500 in his ABLE account and $1,500 in his checking account. Since his countable resources are now $3,000 ($1,500 from ABLE account + $1,500 from checking account), his ABLE account has caused him to exceed the resource limit and his SSI payments are indefinitely suspended. Mario continues putting money in his ABLE account for 24 more months and his indefinite suspension continues. Then, with the account balance standing at $107,000, he takes a $21,000 distribution to purchase a new car (a Qualified Disability Expense), dropping his account balance to $86,000 at a time when his checking account balance stands at $850. Since the ABLE account balance is below $100,000 it is once again exempt and his only countable resource is the $850 in his checking account. Mario’s SSI payments will be restored without the need for a new application. Mario had Medicaid eligibility continue when his SSI payments were suspended for 24 months based on excess resources caused by the ABLE account. To read a more detailed case study and analysis, see ABLE National Resource Center. Prior to investing in an ABLE account investors should consider whether the investor's or designated beneficiary's home state offers amy state tax or other benefits that are only available for investments in such states's ABLE program. 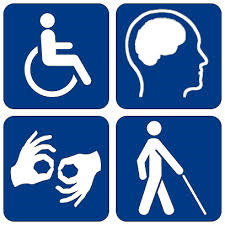 Withdrawals used for qualified disability expenses are federally tax free. Tax treatment at the state level may vary. Please consult with your tax advisor before investing.